You are currently browsing the category archive for the ‘Manufacturer’ category. -Daniele brand pepper-coated Salami recalled after potential link to outbreak. -184 Illnesses have been reported in 38 states since July 1, 2009. Reports suggest that pepper used in the product might be the source of the illnesses. -Pepper and other dry spices have been linked to salmonella contamination in the past. – A list of recalled products and labels are is attached. -Salmonella Typhimirium outbreak linked to King Nut Brand peanut butter. -5 ill in Wisconsin and one in California linked to burgers produced by Rochester Meat Company. -The ground beef products subject to recall were shipped to distributors for retail to restaurants and food service institutions. -Cook hamburgers and all ground beef to an internal temperature of 160F or 71C. 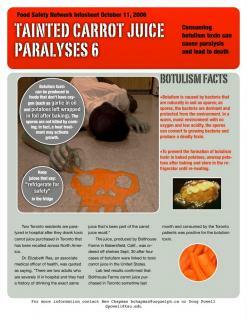 -Due to the FDA announcing peanut butter being linked to Salmonella we have produced a second infosheet for this week. -A special Valentine’s infosheet for this week. 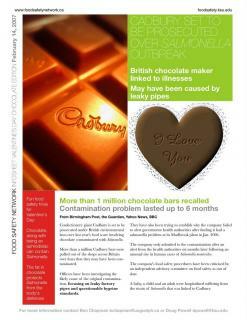 A few months ago a Salmonella outbreak in Cadbury’s chocolate was in the headlines. Now litigation is going through the courts and the problems are starting to mount. -Carrot juice is suspected in hospitalizing 2 people in Toronto. A recall of the juice is in effect.